Ed here: I wrote last week that I didn't much like James Bond books or movies. I should've mentioned that a few of the movies were fun and enjoyable for me. I'm noting that James Bond had one hell of a weekend. Mea culpa. 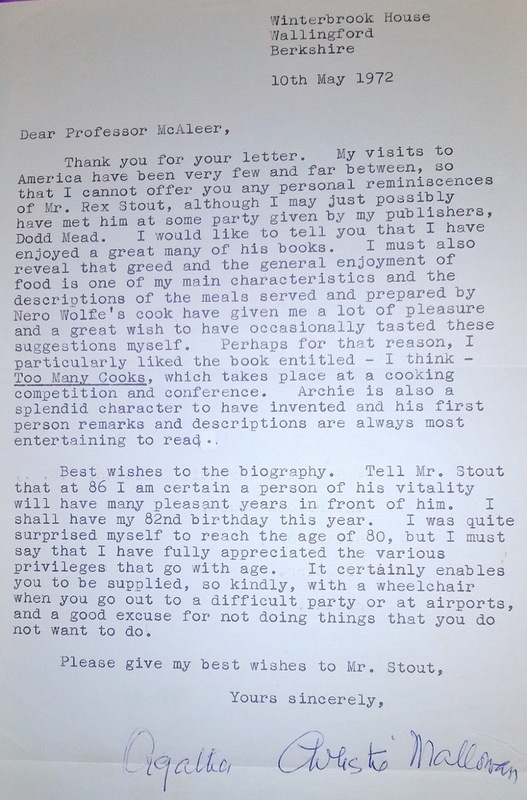 "The Lady and the King. . .Christie on Stout"
Devotees of Ed Gorman's Blog will enjoy this original publication of a May 10, 1972 signed missive from Dame Agatha Christie to my father John McAleer, while he was writing the future Edgar Award winner Rex Stout: A Biography. Here Dame Agatha shares her thoughts on Stout, Nero Wolfe & Archie, her love of food, and what it's like to be an octogenarian. Cool letter. I remember doing a little favor or two for John McAleer when he was working on that book, and I corresponded with him for several years.